Bermuda has been named as the host of the 35th America's Cup, taking place in June 2017. The official announcement came from the lips of the Cup's commercial commissioner Harvey Schiller at a press conference in New York City on Tuesday. For close followers of the Cup, however, the cat had been out of the bag for a couple of weeks after Bernie Wilson, sailing correspondent for the Associated Press, broke the story last month and sent rumours flying that Bermuda would be hosting the America's Cup 2017. To the surprise of many, Oracle Team USA, the American defender rejected the other candidate, San Diego, California, in favour of an island nation more than 600 miles off the Atlantic coast of the US. Sir Ben Ainslie, head of the British challenger Ben Ainslie Racing, was delighted with the British Overseas Territory being selected as the host venue. Joking about Bermuda's relative proximity to Great Britain, and his task of bringing it back to Britain after the Auld Mug departed British shores back in 1851, Sir Ben commented: "We're halfway there!" Speaking exclusively to Boat International, he added: "I have a personal history with the island and the Bermuda Gold Cup, and I’ve always really enjoyed being there for the sailing conditions, the island is beautiful and I still having strong ties there. It’s also that much closer to the UK so the travel is easier, and the time difference to the UK means that the commercial implications for television are good." So what does Bermuda have to offer the Cup? Well, no one at the press conference mentioned the benefits of an offshore tax haven. Instead Michael Dunkley, the Premier of Bermuda, drew attention to a number of other compelling reasons to host a mid-Atlantic Cup. 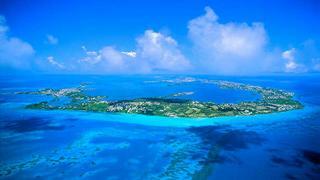 "Bermuda's bid was designed around our many strengths, including our near perfect sailing conditions, our temperate year-round climate for team training, our optimal location and time zone for visitors and television viewers alike, the intimate and unmatched setting offered by Bermuda's Great Sound, our maritime legacy and innovation, and the spirit and hospitality of our people." Schiller also praised Bermuda's sailing conditions, and he lauded Bermuda's Great Sound as "a natural amphitheater with room for racing and spectators, amid a spectacular backdrop of islands and beaches." A massive America's Cup Village has been proposed at the Royal Naval Dockyard. Six teams have are challenging for the oldest trophy in international sport. These include Defender Oracle Team USA, Emirates Team New Zealand, Artemis Racing from Sweden, Ben Ainslie Racing from the UK, Italy's Luna Rossa Challenge and Team France. It's hard to imagine that anyone other than hard-core sailing fans will make the pilgrimage to watch the America's Cup in Bermuda. So has Russell Coutts abandoned his grand vision for turning the Cup into a mainstream sporting event in favour of something more intimate and more elite? The decision to go to Bermuda would suggest so. And perhaps that's no bad thing.